If I’m honest I prefer side 2. 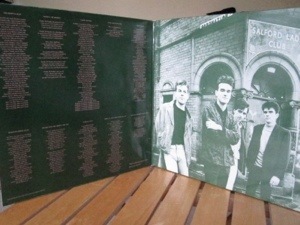 Just look at that track list – Bigmouth Strikes Again, The Boy With a Thorn in His Side, There is a Light…. While much is made of Morrissey’s lyrics, above all the appeal of The Smiths for me will always, always be the tunes. I know that this is hardly a grand claim, but those three songs pretty much sum up The Smiths for me. That and Girlfriend in a Coma but I can’t write about that yet (it’s in one of the boxes somewhere). It was The Boy With a Thorn… which actually switched me onto The Smiths, aged 15, hearing for the first time played on the school bus. I suddenly got it. After that Duran Duran were history…. I was a relative latecomer to The Smiths and never saw them live but I did manage to see Morrissey at Bradford St George’s Hall in 2002. He was without a record deal at the time and I remember the sublime First of the Gang to Die was a particular crowd favourite before it saw the light of day as a recording. But it was There is a Light… that still brought the house down 16 years later. That’s what we were all there for really. Run out groove quotes: (1) Fear of Manchester. (2) Them Was Rotten Days. 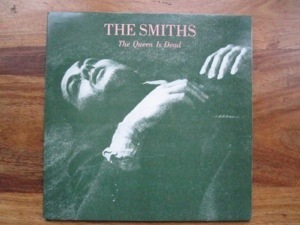 This entry was posted in 1980's and tagged 1980s, Boy With a Thorn in His Side, Johnny Marr, Morrissey, Music, The Queen is Dead, The Smiths, There is a Light That Never Goes Out, Vinyl. Bookmark the permalink. There was a saying in hockey – there are players, stars, superstars, and then there was Bobby Orr. Same here – there are groups, solid groups, superb groups, and then The Smiths! Around the time of its release I remember seeing a poster for Rank and thought they had reformed, not realising it was ‘just’ a live album. It was of course before the internet, when you didn’t know everything all the time. Bowie’s recent activity has helped me realise that I sort of miss those days.